So I’ve recently spent three days exploring St Petersburg in Russia. This was my second visit to Russia, my first being to Moscow 10 years ago. It’s a fascinatingly unique country with a strong, and somewhat aggressive personality. I’ll tell you all about what to see in this beautiful city later, but for today we’re tucking into Russian cuisine at the Russian Vodka Museum. The restaurant is attached to the museum where you can see how vodka is made and have a tasting. We settled down to sample some typical Russian cuisine from a menu that offers dishes from different historical periods and over 200 types of vodka. 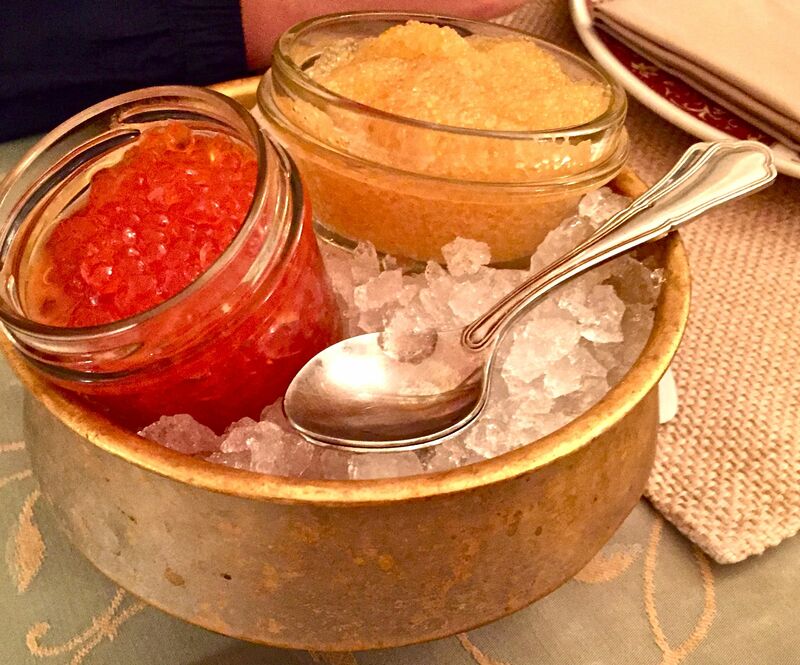 When you’re in Russia, you simply have to eat caviar. This ultimate delicacy of salt-cured fish eggs traditionally came from wild sturgeon in the Caspian and Black Seas (beluga, ossetra and sevruga) but nowadays you can get caviar from a range of other fish including salmon, trout, lumpfish and whitefish. The rarest and costliest is from the beluga sturgeon that swim in the Caspian Sea which is bordered by Iran, Kazakhstan, Russia, Turkmenistand and Azerbajan. Iran is the world’s biggest exporter. Interestingly, wild caviar production was suspended in Russia between 2008 and 2011 to allow stocks to replenish. 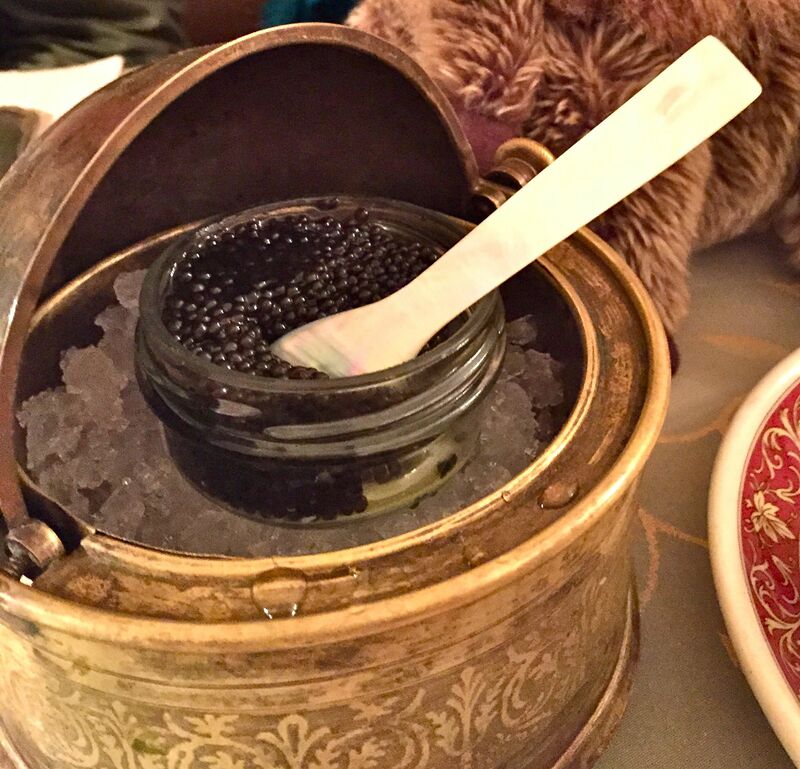 The basic rule of caviar is the bigger the egg the more prized it is, beluga is pea-sized. 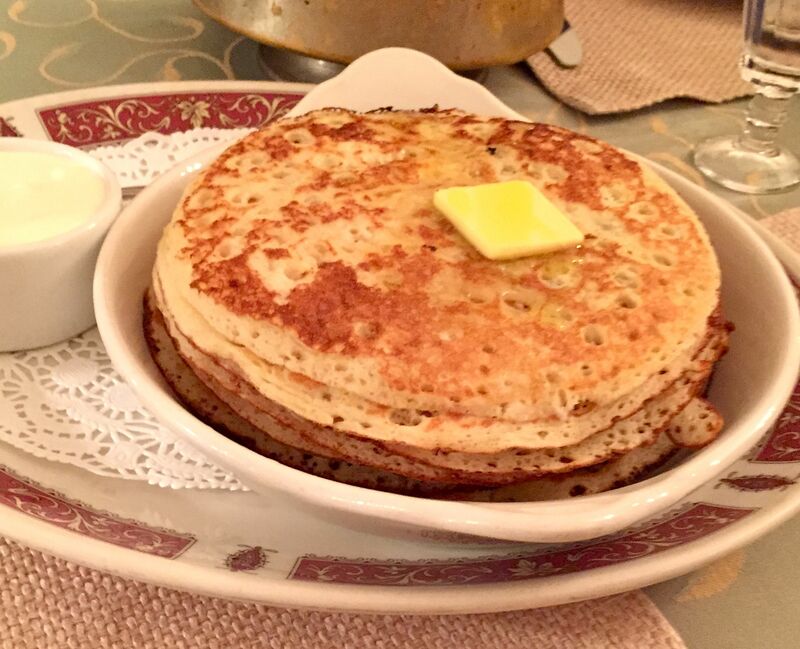 We opted for a selection of pike, salmon and sturgeon all served on ice and with the most perfectly prepared pancakes (blinis) that I’ve ever tasted. All made for a beautifully colourful display as well as a real taste sensation. I love its fishy creaminess. This was my favourite of the three, love its little container, too. This was a very difficult menu to order from. There’s such a wide selection of dishes, and I really wanted to try something different – but nothing crazy, of course, so couldn’t bring myself to order chicken hearts and stomachs stewed in the oven. I’m adventurous but that’s a step too far! This starter is called Moscovskaya Zakuska. 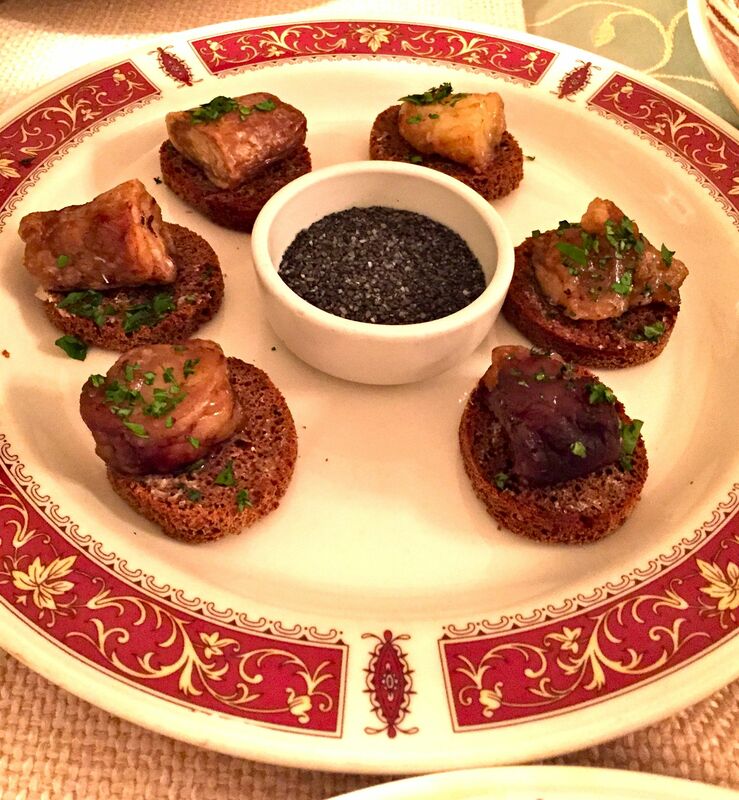 Baked bone marrow on Borodinsky bread served with Kastroma black salt. Borodinsky bread is dark brown sourdough rye bread that is traditionally sweetened with molasses and flavoured with coriander and caraway seeds. A very rich, melt-in-the-mouth dish. 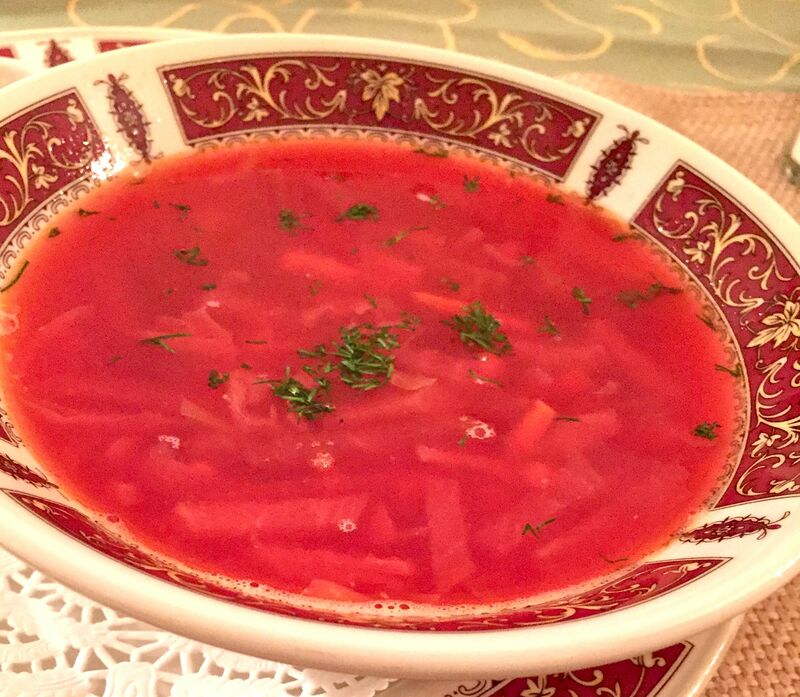 I love borsch, so I had to sample the St Petersburg version. Ukranian beetroot soup with veal and cabbage – plenty of tender veal strips, and really pretty and pink. 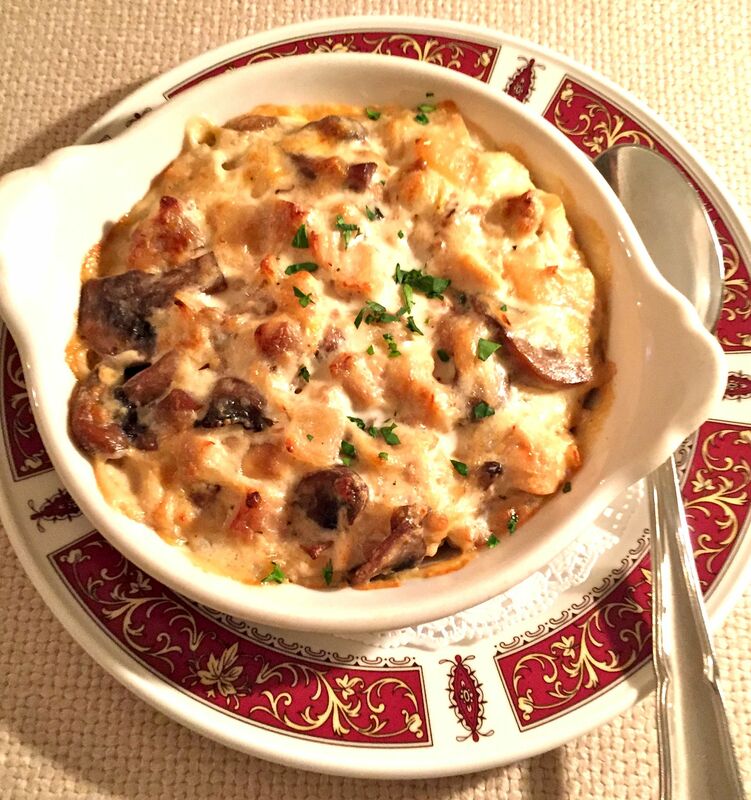 This tasty little starter was a small, creamy chicken and mushroom casserole. And then on to mains. After much deliberation I decided to plump for the Pozarsky minced chicken cutlet with a mushroom sauce. This ground chicken cutlet with homemade breadcrumbs is attributed to Prince Pozharsky at the beginning of the 19th century. Legend goes that he wanted to serve Moscow’s crown prince his favourite veal cutlets but there was no fresh veal in the kitchen so he ordered his chef to prepare it with chicken. The crown prince loved it so much he asked for the recipe. 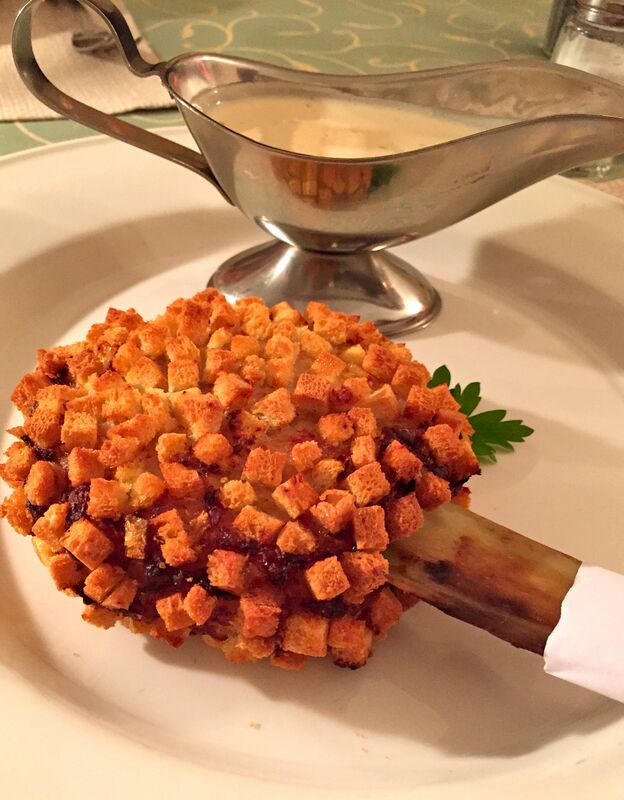 I loved it too, the minced chicken was beautifully flavoursome, moulded around a bone (not a chicken bone, so it did look like it could be veal) and covered with crunchy, larger breadcrumbs, a bit like mini croutons. A delightfully light dish with an equally light mushroom sauce. Good choice! Another Russian favourite (and one I’ve made myself), beef stroganoff. 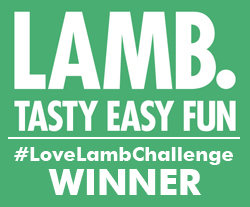 Tender, creamy meat served with lashings of buttery mash. And there’s a story to it, too. Of course. 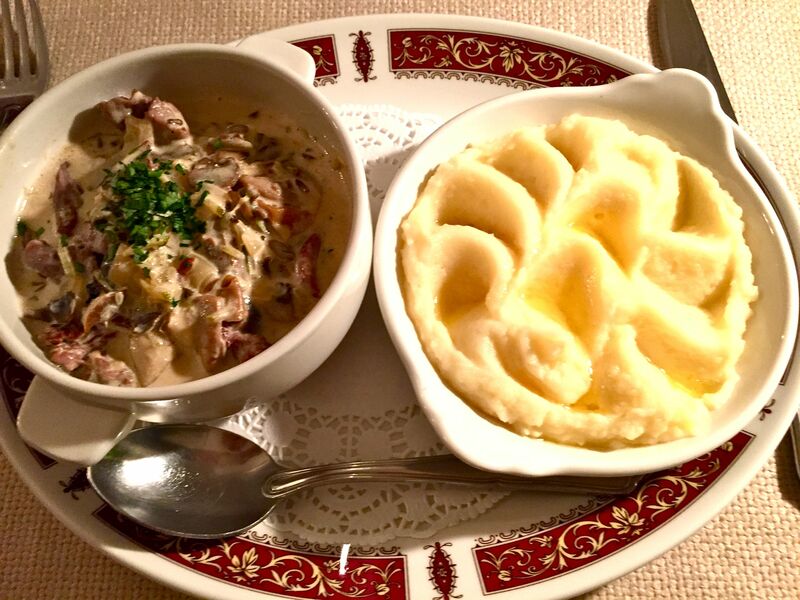 Said to have originated in mid-19th century Russia, it’s thought to be named for Count Pavel Stroganoff, a celebrity who loved to entertain and often served up this delicious dish. Or it could be named for another member of the Stroganoff family, it seems they were quite a family of gourmets. A classic. The Russian Vodka Museum is at 4 Konnogvardeisky Boulevard, St Petersburg.